Watching YouTube videos has become a daily experience for a majority of users. Guess right, when it refers to online video, the video sharing site YouTube really matters. But do you want to burn YouTube to DVD so that you can watch online videos on your home or car DVD player whenever you like. Or else, you wanna keep your favorite YouTube videos or movies forever in case of being deleted. Whatever the reason, you might need a profession DVD burner to hook you up. Video to DVD burner is a handy DVD Creator that facilitates you to convert and burn online video to DVD. Users can burn any video format like avi, MKV, wmv, mov, flv, 3gp, mp4 to DVDs in a super easy and fast way. The video file size determines the duration of conversion process. 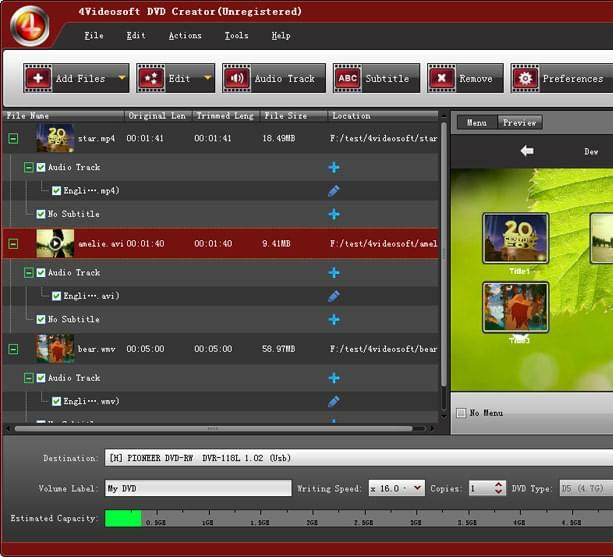 This program serves many functions like online video to DVD converter, burner, editor, template creator and more. Just utilize it to create your personalized DVDs and watch YouTube or any online videos on DVD. You may burn online video to DVD discs like DVD+R DL, DVD-5, DVD-RW, DVD+R, DVD+RW, DVD-R DL, DVD-9, DVD-R DL. The video to DVD burner also provides you Edit Menu to do some decorations for DVD menu. A wide selection of beautiful templates will make it more impressive and background music or picture can be added in the DVD as well. Moreover, this feature supports customizing Frame, Button and Text. Just customize your DVD menu playback. In order to get a better viewing effect on your DVD player, you might need to do some basic editing job. No need to install other video editor software, this app also employs simple cutting, trimming, watermark and better effect like brightness, saturation, contrast etc. Add your favorable audio track to the video. Do some settings like Volume, Encoder, Bitrate, Latency etc based on your preferences. Just site an example here, if you wanna burn YouTube to DVD, but the video is in foreign language without subtitles whatsoever. You just need click Subtitle tab to add external subs so that you can watch it without any difficulty. The video preview feature on the right window can make you easily keep track of your entire DVD project. After loading a video into the program, if everything is Okay, you can proceed to the next step. Now the last step is to output online video to DVD, after previewing, click Burn to conduct fast conversion. The video will be saved in your DVD with high quality. Rating: 4.3 / 5 (based on 45 ratings) Thanks for your rating!